Artwork Panel: 51.5cm x 98.6cm ≈ 20¼" x 38¾"
Silk/Brocade: 60.2cm x 154.2cm ≈ 23¾" x 60¾"
Width at Wooden Knobs: 69.2cm ≈ 27¼"
This is Hua Tuo who lived from 140–208 AD. 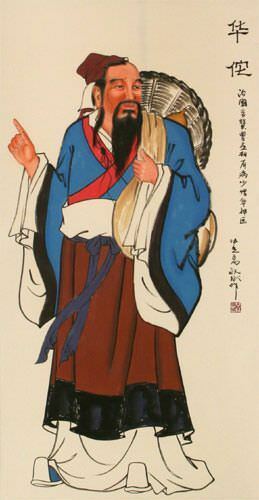 He was an ancient Chinese physician who lived during the late Han Dynasty and Three Kingdoms era of Chinese history. The Records of Three Kingdoms and Book of Later Han record Hua as the first physician in China to use anesthesia during surgery. He created his anesthetic by combining wine with a herbal concoction of cannabis powder. Besides being respected for expertise in surgery and anesthesia, Hua Tuo was famous for his abilities in acupuncture, moxibustion, and herbal medicine. Some call him the father of modern medicine. But his technique of using anesthesia was more than 1500 before western medicine caught up (in 1859 when western physicians used cocaine as their first anesthetic). You may also see his name written as . Same person, just an alternate way to write his name.